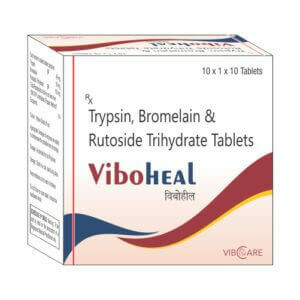 Trypsin is a serine protease that plays an essential role in protein hydrolysis and absorption in mammals. When converted from its zymogen trypsinogen, trypsin is available as an active peptide hydrolase (EC 3.4.21.4) form to cleave peptide chains, mainly at the carboxyl side of the amino acids lysine or arginine. Trypsin contains a nucleophilic residue Ser in the enzyme active site which attacks the carbonyl moiety of the substrate peptide bond to form an acyl-enzyme intermediate [A27241]. This nucleophilic attack is facilitated by the catalytic triad consisting of histidine-57, aspartate-102, and serine-195. Trypsin also contains an oxyanion hole that stabilizes the charge negative charge on the carbonyl oxygen atom formed from the cleavage of peptide bonds. Therapeutic forms of trypsin is obtained from purified extracts of porcine or bovine pancreas and is intended to aid in digestion when administered orally. Bromelain is a protease enzyme derived from the stems of pineapples that is composed of a mixture of different thiol endopeptidases and other components like phosphatase, glucosidase, peroxidase, cellulase, escharase, and several protease inhibitors [A27198]. It works by selectively inhibiting the biosynthesis of proinflammatory prostaglandins [A27197] and also has analgesic properties, as well as anticancerous and pro-apoptotic effects. Bromelain holds potential therapeutic effect as a treatment of conditions including angina pectoris, bronchitis, sinusitis, surgical trauma, and osteoarthritis. It is considered as a safe food supplement. It is usually well tolerated. Harmless alteration in the consistency, color and odor of stool may occur. A sensation of fullness, flatulence, and occasional episodes of nausea are possible during high- dosage administration. If these symptoms persist doctor should be consulted. Allergic reaction occurs rarely and disappears after the discontinuation of the drug. 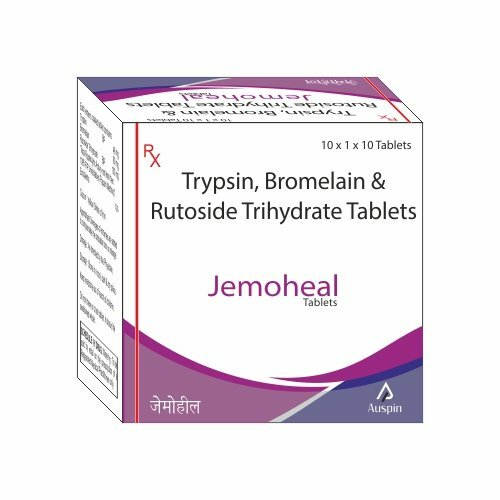 Indicated for inflammatory episodes of rheumatic and degenerative conditions, such as Rheumatoid Arthritis, osteoarthritis, Spondylopathies, Tendonitis and Bursitis.